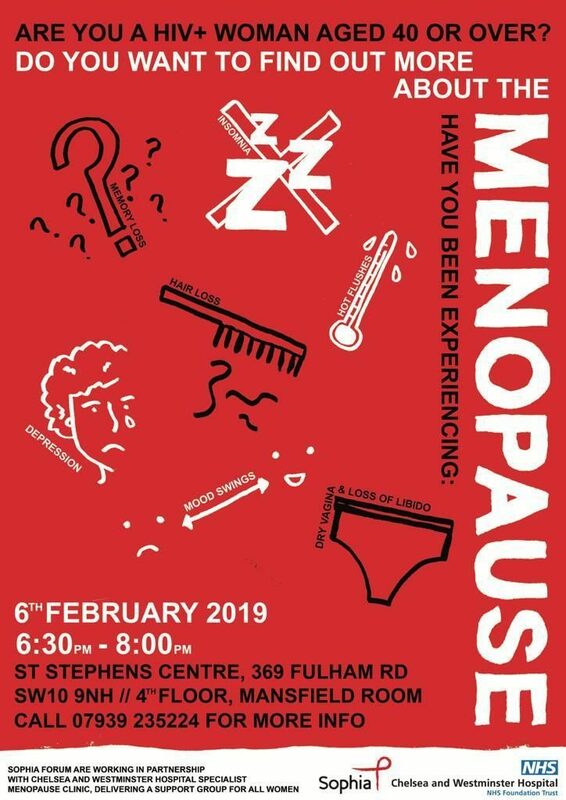 The Sophia Forum and Chelsea & Westminster Menopause Clinic are working in partnership to deliver a new peer support group for women experiencing the menopause. 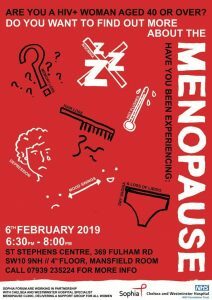 It has been recognised there is not enough support for women as they approach and enter the menopause. This safe space will enable women to come together, receive information from professionals in the field and other speakers over the course of the next couple of years. It will also enable women to share their experiences and learn from each other what has worked for them or what their challenges are. Groups will be held on a 3 monthly basis. Our very first group will be held on Wednesday 6th February from 6.30-8.00PM. Doors will be open from 6.00PM. This is for HIV positive women only. Address: St Stephens Centre, 4th Floor, Mansfield Room, 369 Fulham Road (next door to Chelsea & Westminster hospital). The contact number is 07939 235224. Travel will be reimbursed and light refreshments available.